Salt Lake City, UT – July 24, 2014 – Monnit Corporation (www.monnit.com), a leading provider of wireless sensing solutions for commercial, light industrial and consumer applications, today announced the release of a new Ethernet Gateway. The new Ethernet gateway provides a host of enterprise level features and numerous enhancements over previous versions. “We’re very excited about the new markets this opens up for Monnit’s OEM and integrator partners. The new functionality of the Ethernet gateway will help them and us expand our enterprise customer base by giving customers access to interface options needed for integrating Monnit’s wireless sensors into established infrastructure systems, such as building managements systems.” said Brad Walters, CEO of Monnit Corporation. Of most importance is the ability for users to access and send wireless sensor data directly from the Ethernet gateway to their own software systems. The ability to use multiple interfaces simultaneously. Easy customization for Enterprise customers and partners. Integrated web server for custom configuration direct from a PC. Can interface with Monnit Express local PC software (no external Internet required). Optimized data communication management for networks containing large numbers of wireless sensors. All Ethernet gateways ordered from July 21, 2014 and on, will ship with the new product. Current customers can update their existing Ethernet gateways through the “Manage” section of their iMonnit online account (Basic or Premiere). For more information on the Monnit Ethernet Gateway visit http://www.monnit.com/products/Gateways/Ethernet-Gateway. Monnit is a leader in the design and manufacturing of turnkey, self-installing, low-cost wireless sensor solutions targeted at the commercial, light industrial and consumer markets. Monnit’s sensing solutions are designed to be easily installed and used by anyone wanting to remotely monitor information and activities around a variety of variables (i.e. temperature, motion, humidity, vibration, etc.) and receive alerts based on user defined conditions. There are numerous things you want to know about your boat when you are not there. Boat bilge pump failure can be catastrophic when it comes to your boat or watercraft staying afloat. Maybe you want to go out on the boat this weekend, do you know if the battery is still holding a charge? Monnit wireless sensors can let you know the moment an issue arises. Water Detection Sensors Monitor water in the bilge. Detect if water reaches a certain level and the pump has not turned on, indicating a pump issue. Battery Health Sensors Monitor and track the voltage of boat batteries. Motion Detection Sensors Monitor and detect motion in and around boat. 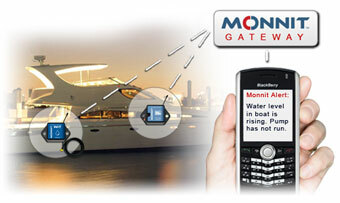 Protect Your Boat and Wallet with Monnit Wireless Sensors! This tech-tip is meant to give to give some suggestions for installing and using the Monnit Wireless Battery Health Sensors. For product documentation and additional help visitwww.monnit.com/support. Monnit Wireless Battery Health Sensors are analog voltage meters designed to measure battery voltage at specified intervals and wirelessly send the voltage readings to iMonnit, the online sensor monitoring system. Monnit battery health sensors can measure battery voltage up to 48 VDC. 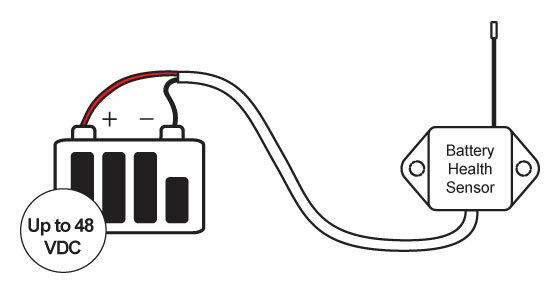 The following steps will demonstrate the correct way to connect the wireless battery health sensor to a battery you wish to monitor. • Ensure that battery being connected is rated at 48 VDC or less. • Remove sensors battery(ies) prior to connecting to monitored battery. • Connect the sensors red wire to the “positive” side of the battery. • Connect the sensors black wire to the “negative” side of the battery. Once the sensor has been successfully connected to the battery, you can insert the sensor battery(ies) to power up the device. Check that the sensors information is being received in the iMonnit software. If sensor data is not being received, make sure that the MonnitLink gateway is powered on and that your sensor is within wireless range of the gateway.